NEW BRITAIN - The Innovation track and field team competed at the Irv Black Invitational at Veterans Stadium in New Britain on Saturday. Among the boys, Elijah Pouncey qualified for the finals of the long jump and finished fourth, jumping a season best; Lester Emanuel III finished 15th in the 100-meter dash; Malachi Bolden finished 13th in the 200-meter dash; Quentin Askew finished fourth in the 400 hurdles; and Jean Soto qualified for the finals of the discus and finished in eighth place. In relay events, the 4x400 team of Bolden, Jesus Santiago, Andre Sterling and Askew had a phenomenal race, as a strong final two laps by Sterling and Askew put the Ravens into third place and set a new school record; and the 4x800 team of Anthony Corso, Charlton Morgan, Sterling and Santiago finished in sixth place. 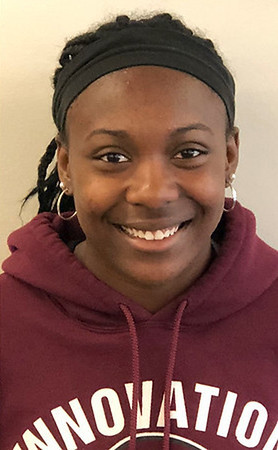 Among the girls, Reya Joseph finished 11th and Aryanna Townsend was 13th in the 200-meter dash; and Aaliyah Walker qualified for the finals in the triple jump and finished seventh. Walker also finished in fourth in the 400 hurdles. Southington 3, South Windsor 0: The Blue Knights cruised to a victory at South Windsor on Friday night, 25-12, 25-15, 25-16, improving to 12-1 for the season. Tim Walsh, William Pfanzelt and Jonathan Clark had seven kills each for Southington, while Zack Morgan had 12 assists and Niko Sophroniou had nine digs. Posted in New Britain Herald, Innovation, Southington on Sunday, 13 May 2018 21:24. Updated: Sunday, 13 May 2018 21:26.